The statue has been outside the church for 10 years. 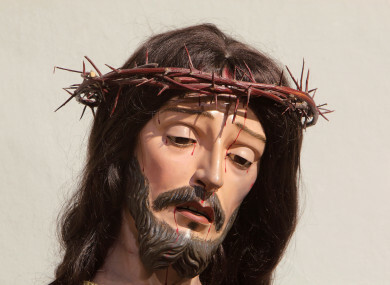 A BAPTIST CHURCH in South Carolina plans to remove a hand-carved statue of Jesus Christ because some congregants believe it’s too “Catholic” for their place of worship. The hand-carved, 7-foot (2-meter) statue and accompanying reliefs depicting scenes from Christ’s life have been displayed outside Red Bank Baptist Church in Lexington for a decade. But in a letter to the artist, Pastor Jeff Wright said the art would be removed this week. “We have discovered that there are people that view the art as Catholic in nature,” Wright wrote in the letter to Delbert Baker Jr. A friend of Baker’s posted the letter on Facebook. Wright wrote that the statue and reliefs bring into question “the theology and core values of Red Bank Baptist Church,” but he didn’t elaborate. The pastor did not return telephone calls or respond to messages The Associated Press left in person with his staff at the church this week. The letter said Baker had until Thursday to remove the art if he wanted to keep it. If not, it would be destroyed. Workers at the church refused to tell the AP if that deadline remained in place. The dispute is a symptom of a larger “dysfunction” in the Southern Baptist Convention, said Bill Leonard, a professor of Baptist studies at Wake Forest University. “Almost week to week there’s another incident in which southern Baptists portray themselves … having convictions that look like bias and prejudice in the larger culture,” Leonard said. The bias is so deep that they even think they have the wrong Jesus is in front of their church. In his own letter responding to Wright, Baker explained his vision of the art, saying it was meant to show Red Bank Baptist had a focus on Christian outreach. “This is why Christ is represented as though he is stepping outside of the building, not just confined to the idleness of inner walls,” Baker wrote in the letter, which his friend also posted on Facebook. Under each arm, the reliefs depict scriptural and historical events that we as Christians believe represent the life of Christ. The reason that has been given for removing the art makes no sense, Baker added, because a large sign out front identifies the building as a Baptist church. Instead, the explanation makes it appear that congregants are disparaging Catholics, Baker wrote. “I was obedient to my Lord in creating it and after much prayer I must respectfully decline to take part in its removal,” Baker wrote. Baker did not respond to telephone messages from the AP. Email “A Baptist church is getting rid of its statue of Jesus because it's 'too Catholic'”. Feedback on “A Baptist church is getting rid of its statue of Jesus because it's 'too Catholic'”.